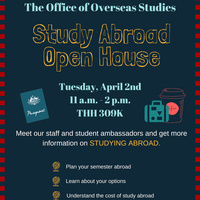 Overseas Studies Staff and Study Abroad Amabassadors will be available to answer any questions you have about study abroad. This is a great oppotunity to learn what your options are and start planning your time abroad. Food provided!